Growing watermelons up up up! If you read the title of this post and thought “what, vertical watermelon…she must be crazy” then you might be right, but I think it is worth a try. I have read about people growing watermelon vertically and so I know it is possible. Now I just need to figure out if it is possible for me. I started my watermelon from seeds a couple of months ago. I started training then to grow vertically just recently (once the plant had gotten pretty big. I bought a wooden trellis from the garden store. When I put the trellis into the ground I made sure to put it extra far into the ground to give it some extra strength. The watermelons will be heavy so it is really important to reinforce the trellis. I also planted sugar baby watermelons so that they would be on the small side. I have been doing lots of research on this topic and have learned that when growing melons vertically it can be necessary to create some sort of hammock to support the growing melons. However, I have read many garden blogs that report that with the smaller melons (like sugar baby), a hammock is often not necessary. When growing squash and melons vertically, the stem thickens more than when the fruit is on the ground so that it can support the hanging fruit. This makes sense if you really think about it. Here is what I have done so far. I planted my seedlings and let them grow to about 3 foot long vines. Each plant has had 3-5 vines. 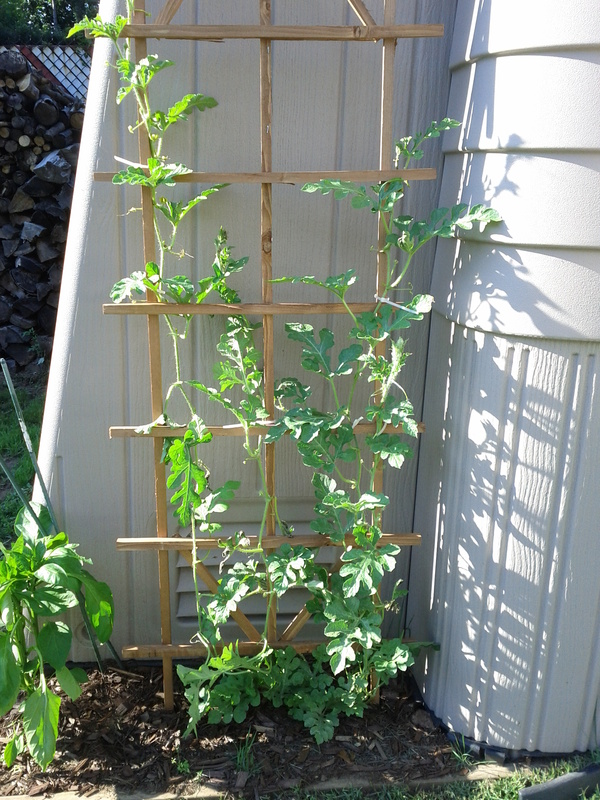 Next, I added the trellis and when the vines get to be about 3 feet long, I attached them to the trellis. I used zip ties to loosely attach the vines to the trellis. It is very important for the zip ties to be loose so that the vines have room to grow. The vines will also begin attach to the trellis on their own over time. My watermelon plants have done beautifully since attaching them to the trellis. I actually think they are growing faster than before and look healthier (tons of yellow flowers and green leaves). I am truly learning as I go on this adventure. I am going to add the link to several of my favorite websites that discuss and give tips about growing watermelons vertically. I will update this post in a couple of weeks as to how this vertical adventure is advancing. I sure hope this works because wouldn’t it be amazing to grow each watermelon plant in just one square foot? Wow! Happy gardening! Have you every grown melons vertically? What is your favorite thing growing in your garden this year? Your plants look really heathy and they have grown quickly. Good luck! Thank you for the pingback! Good luck with your watermelons. If they are your standard watermelon you will need to make a fabric sling for them for they will likely break off the vine before they are ripe. Some of the smaller varieties will be able to hold on without the support. I accidentally ran into your article, Kelly. Thank you very much for the detailed and very understandable description of growing watermelons. I have only been trying to grow my watermelons for three seasons, but the results are not very good. But now many questions have disappeared due to your article. Enter your email address and receive all my new posts in your inbox.